ROLEX. A FINE AND RARE 18CT GOLD AUTOMATIC WRISTWATCH WITH TRIPLE CALENDAR AND MOON PHASE "STAR DIAL"
Nickel finished self-winding movement with patented Super-Balance, silvered dial with luminous star markers, day, month and moon phase aperture, outer date ring, subsidiary seconds and luminous Dauphine hands, tonneau shaped "Super Oyster" case with screw down back. Ref:6062 was produced in 350 yellow gold examples, 50 pink gold examples and rarely in stainless steel from 1950 to 1953. 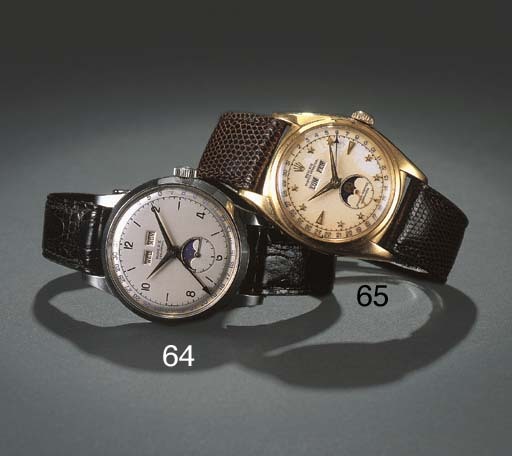 Watches with "Star Dials" are rare.